Sree Rama Navami is celebrated on the 9th day after the beginning of the new year as per Hindu Calender. While we celebrated the beginning of the new year as 'Ugadi', we will be celebrating 'Sree Rama Navami' on 25th March. 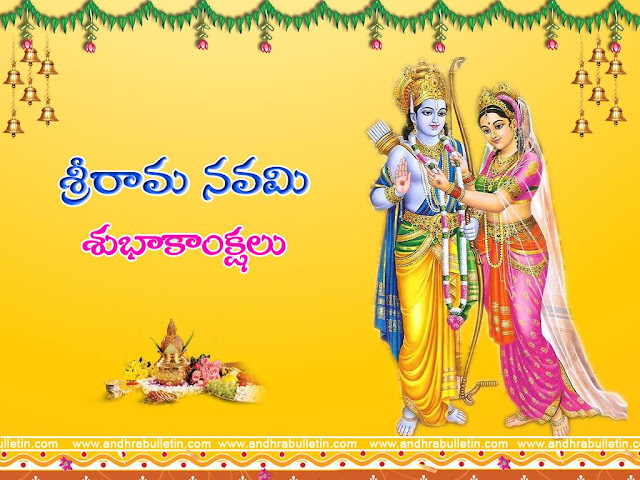 Sree Rama Navami is celebrated on the birthday of Lord Sree Ram and also as the marriage day of Ram with Sita. People might argue about Lord Sree Ram giving Agni pareeksha to Sita Devi but their love to each other is eternal. Sree Rama is the embodiment of high morals and being a great king he has more responsibilities than an ordinary person. Sita Devi is also an incarnation of Goddess Lakshmi and is also someone who moved the Shiva Dhanussu with one hand while playing at her young age. Ram and Seeta were made for each other and their love, respect, and understanding to each other were ideal cases for a marriage. That is the reason, Kalyanam(Marriage to Ram and Sita) is conducted every year in Bhadra chalam on Sree Rama Navami. Like other festivals, we take the head bath, wear new dresses and perform Pooja at our home. We go to temple in the morning to visit Sita Rama Kalyanam. We prepare and offer 'Panakam' (A drink made with jaggery powder, cardamom, and peppercorns), Chalividi (sweet made with jaggery and rice flour) and Vadapappu (Soaked moong dal) to God. Sita Rama Kalyanam done at Bhadrachalam (Now in Telangana state) is very special. As a custom, the chief minister offers silk clothes to the divine couple every year. The Kalyanam is aired on all TV channels for devotees. Panakam is best for the hot weather that we experience at that time in India. The preparation of Panakam is very easy and it is good for health to reduce body heat. Jaggery powder is mixed in water until it is dissolved and crushed pepper and cardamom are added to the water. Tulasi leaves are also added at the end. This is the way it is celebrated in Andhra Pradesh, whereas in other parts of India people read holy books like Ramacharitha manas and Sundara Kanda at temples on that day. Do you celebrate Sri Rama Navami? What rituals do you follow? Do let me know in comments. I'm from a totally different culture so this isn't part of my experience. I hope that you are having a really good day and a good holiday. I simply love panakam and neermor. All the best. Happy Ram Navami and I enjoyed my cup of panagam this year at my moms place! Belated happy Ram Navami to u. Its lovely to read about festivals n celebrations. Gives you the zest to carry on.